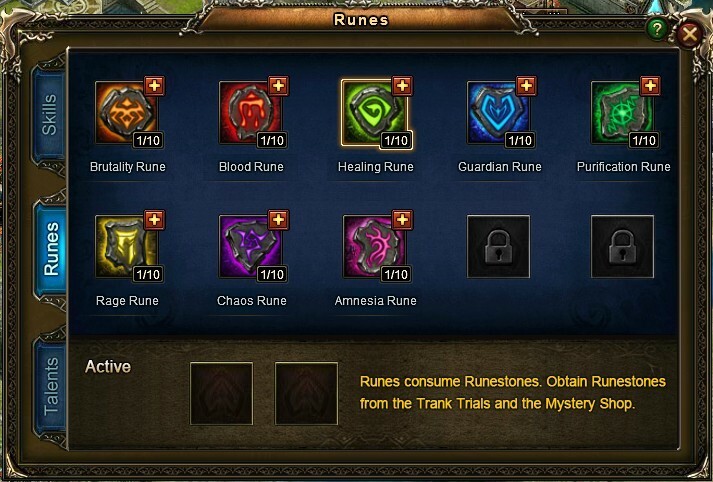 The Rune system is unlocked when your hero level reaches Lvl.35. 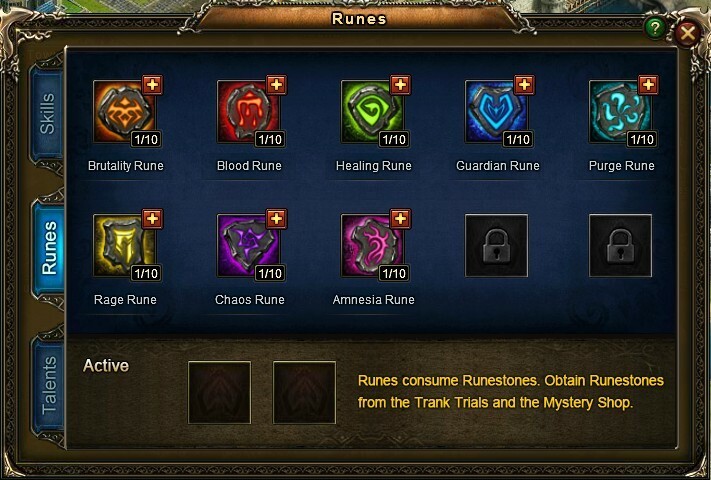 Runestones are also needed to upgrade Runes. A type specific Runestone can be used to upgrade its own Rune by 100 exp or any other Rune by 10 exp. 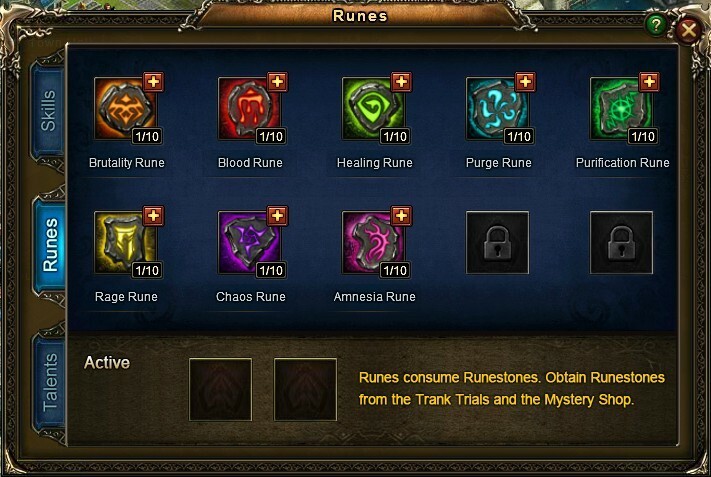 In addition, small, medium and large generic Runestones can be used. ◾Small Runestone - 50 Exp - Acquired from 80 Devotion, Tank Trials, Mystery Shop, and Glory Shop. ◾Medium Runestone - 200 Exp - Acquired 5 from level 35 Quest, Mystery Shop, Glory Shop. ◾Large Runestone - 1000 Exp - Mystery Shop, Glory Shop. There is a limit of using 1000 Runestones per day. Brutality Rune: Damage boost, lasts 2 turns. Blood Rune: Causes a random enemy to bleed and lose HP. Chaos Rune: Deals damage to a random enemy (attacks players first). Targets' attacks have a chance to hit members of targets' own party. Effect will not work if leader of party is a monster. Level 1: Deals 90% damage. 30% chance to hit members of targets' own party. Effect lasts 1 turn. Level 2: Deals 100% damage. 30% chance to hit members of targets' own party. Effect lasts 1 turn. Level 3: Deals 100% damage. 40% chance to hit members of targets' own party. Effect lasts 1 turn. Level 4: Deals 100% damage. 50% chance to hit members of targets' own party. Effect lasts 2 turn. Level 10: Deals 100% damage. 100% chance to hit members of targets' own party. Effect lasts 3 turn. Amnesia Rune: Deals damage to a random target (attacks players first). Chance to prevent the target from using skills (including Holy Seal and Runes). Effects do not work on party leader if party leader is a monster. Level 1: Deals 90% damage. 50% chance to prevent the target from using 1 skill. Effects last 1 Turn. Level 2: Deals 100% damage. 55% chance to prevent the target from using 1 skill. Effects last 1 Turn. Level 3: Deals 100% damage. 55% chance to prevent the target from using 2 skill. Effects last 1 Turn. Level 10: Deals 100% damage. 100% chance to prevent the target from using 5 skills. Effects last 3 Turn.